Lucy Cannon-Neel travels all over the Green Mountain State to teach Abenaki history and culture to elementary school students. But on Wednesday, she found herself co-leading an Abenaki drumming workshop to a much older audience at Champlain College. The workshop was the last in a series of events organized by Melody Brook, operations manager of residential life and adjunct professor with the Division of Education and Human Studies at Champlain College, to commemorate Native and Indigenous Heritage Month. Cannon-Neel, a registered nurse, is the chair of the Vermont Commission on Native American Affairs. Brook is the commission's vice-chair. "We say the drum is the heartbeat of Mother Earth and it keeps everything equal, sound," said Cannon-Neel, when asked about the importance of drumming in Abenaki culture. Drumming can be done at any time, the Holland resident added. Cannon-Neel teaches her students — Abenaki or not — to follow certain etiquette rules when drumming. For example, girls have to wear skirts (not all bands have a dress code). Participants sit around the drum, pass the drum sticks and leave the drum in a clockwise direction. 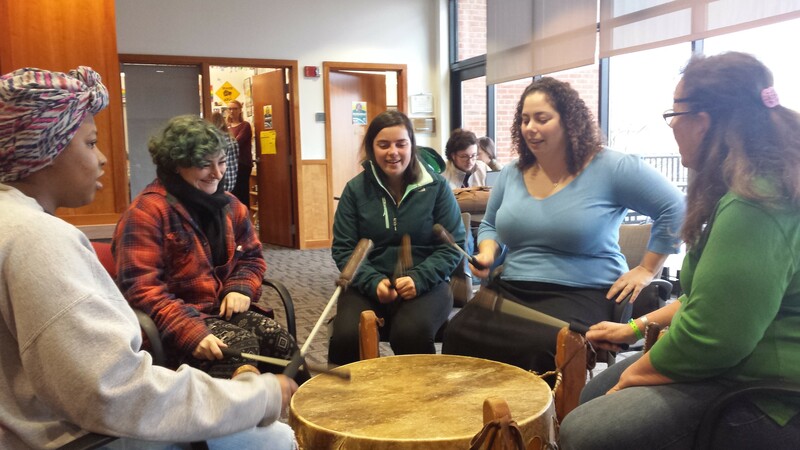 Some Abenaki bands don't allow women to drum, or have separate drumming groups. Cannon-Neel is a member of the Nulhegan group, which she described as being "more liberal" and allows mixed drumming. But all the bands hold the activity sacred. Anyone who wants to drum has to be substance-free. "Once you take your first sip of alcohol, you're done with singing, drumming, everything," said Brook, who is from the Elnu band. Anyone from the group who wants to partake in the activity has to stay substance-free for the whole day, she explained. To kick off the lunchtime event at IDX Fireside Lounge, Cannon-Neel struck the drum four times to honor the four directions: north, south, east and west. She taught participants simple Abenaki words and vocalizations so that they could sing while drumming. Sophomore Alexa von Essen was lounging in the area when she was persuaded to join the workshop. "It was actually really fun ... almost therapeutic, in a way," said the creative media major. "I had never done anything like this before." The workshop attracted a small, multi-ethnic crowd and a handful of curious onlookers. But the intimate setting gave the participants an opportunity not only to learn drumming but to ask questions about Abenaki history. "Vermont wasn't nice to Native people. We went underground," said Cannon-Neel, as she explained the University of Vermont's eugenics program to the group. At the urging of UVM zoology professor Henry Perkins, the legislature in 1931 passed a law allowing the sexual sterilization of "feebleminded and insane" persons belonging to Vermont's "social problem group." Many of those sterilized were Native Americans. These days, Cannon-Neel said more of her own family members are starting to come out and declare their Abenaki heritage. After Wednesday's drumming workshop, she said she's proud to be able to share her culture with the wider community. "I think they got positive energy for the rest of the day from the drumming," said Cannon-Neel at the end of the hourlong workshop.